Most of my doula clients and Birth Boot Camp students are seeking a natural childbirth. Even if they do not want an unmedicated birth, they still want to avoid a Cesarean birth as much as possible. While there is no way to predict birth or guarantee outcomes (isn’t this pretty much true for all of life? ), there are some things you can do to increase your odds of having the birth that you want. I worked hard to prepare myself for all three of my natural births, and below are some ideas of what worked for me. Finding a supportive care provider is the most important thing you can do to have a natural childbirth. There are so many care providers out there and they have different philosophies about birth. Find one who is a specialist in natural childbirth. Midwives tend to be more supportive of natural childbirth, especially those who work outside of the hospital setting. However, there are plenty of awesome OBs out there who are wonderfully supportive of their patients’ natural birth goals. I recommend finding out who these supportive care providers are before you get pregnant because they tend to book up quickly. You can have a natural birth in a hospital, birth center, or at home. Each location comes with its own set of pros and cons, which you will have to consider carefully as you decide where your birth needs to happen. By their very nature, homes and birth centers tend to be more natural birth friendly because that is the type of birth they offer. They are not equipped to provide pitocin inductions, epidurals, or Cesarean births. (They ARE equipped with other life-saving medications and tools if needed.) It is harder to have a natural childbirth in the hospital setting but not impossible. I had one! You will increase your odds of having a natural birth in the hospital setting if you have a supportive care provider and are giving birth in a hospital that has a reputation of being natural birth-friendly. Let me just say this. I am glad this option exists for those situations where it is TRULY needed. But that’s where it gets difficult. How will you know if it is TRULY needed? That’s where choosing a supportive care provider becomes extremely important. You need to be able to find a care provider that you can trust will only recommend an induction of labor if there are legitimate health concerns. If something tells you that your current care provider may not be completely trustworthy in this area, switch care providers. It is never too late. Being induced does not make it impossible to have a natural childbirth, but it makes it much more difficult. Contractions become stronger, longer, and closer together when using pitocin. Much has been written about how induction of labor increases a person’s odds of having a Cesarean birth, but I have also observed this during my years as a doula. You can pretty much throw any intervention at a labor that started on its own and still have a vaginal birth (there are always exceptions, but this is most of the time). If someone is induced, their odds of having the birth that they want has decreased significantly. If you can just go into labor on your own, you will increase your odds of having a natural birth. I exercised at least 5 days a week during all 3 pregnancies. I didn’t do anything extremely strenuous. I just walked 30 minutes a day, but I did it each day. I tried to do it outside when possible to get that lovely dose of happy sunshine. Some people enjoy prenatal yoga or swimming, and others like to continue their crossfit as long as possible. Find what works for you, but keep moving! There are so many benefits of exercising throughout pregnancy. Much has been written about optimal fetal positioning and trying to help your baby find the best position in your uterus for an easier labor. I have mixed feelings about how effective all of these techniques are during pregnancy, but I still believe it doesn’t hurt to try! Chiropractic care, Spinning Babies exercises, and prenatal massage can all help prepare your body for labor. Even if it doesn’t work magic and you end up having a stubbornly malpositioned baby throughout your entire labor until the very end when your baby nosedives out like a boss, it feels nice. It gets oxytocin flowing to be loved on, and oxytocin is a wonderful thing. So much of life is a mental game, and this holds true for preparing for a natural birth as well. Surround yourself with positive people who won’t try to scare you with horror stories. Take a thorough childbirth education course. Listen to affirmations daily. Read uplifting books about childbirth. Pray or meditate daily. Spend time in nature. Spend time practicing gratitude each day. Journal. Process your fears. Do those things that bring you joy. It is tremendously helpful to have a supportive team surrounding you during your natural childbirth. 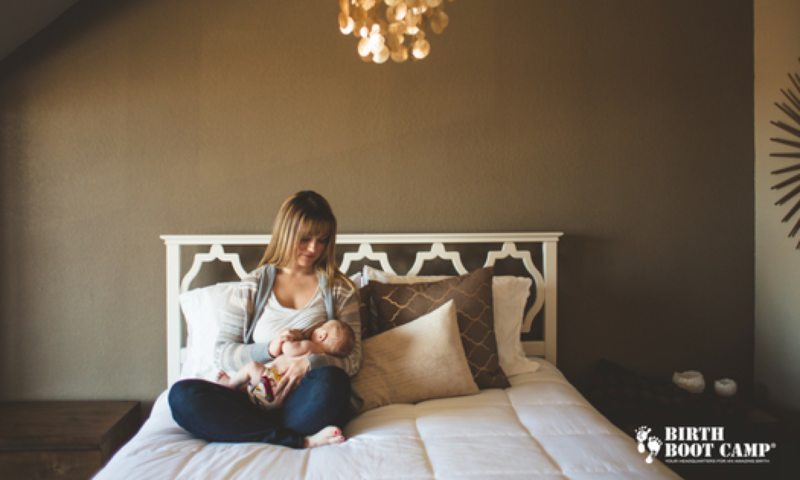 This could be a care provider, partner, mother, sister, friend, doula, or birth photographer. It could be all of the above or none of the above. The important thing is to find those people who add something positive and helpful to your birth space. Find people who can leave their fears and negativity at the door. Surround yourself with those who are familiar with the terrain of birth and who can help you stay encouraged until your journey’s end. There really is no right or wrong way to prepare for giving birth. There is only trying to stack the odds in your favor. After all, people can do “everything right” and still not have the birth that they want. It’s about doing everything you are willing to do that is within your control and surrendering the rest- whether that is to God, the Universe, or some other Higher Power. These ideas may not work for you, but that’s okay! Take what works and leave the rest. No matter what happens, I hope you have an amazing and uplifting experience. Good luck on preparing for YOUR amazing birth!